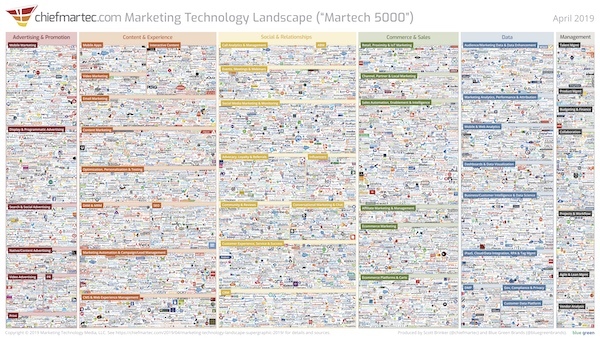 It has become an annual tradition at our spring MarTech conference to release an updated version of maybe the most infamous slide in marketing: the marketing technology landscape. We’re keeping that custom alive this year again. What a crazy graphic! We nicknamed it the “Martech 5000” a couple of years ago. While I like the ring of that — kinda rhymes with the Fortune 500 and the Inc. 5000 — it’s a misnomer. Last year’s landscape already exceeded 6,829 solutions. We’re now up to 7,040 solutions on the 2019 Marketing Technology Landscape Supergraphic. You can still get the original 2011, 2012, 2014, 2015, 2016, 2017, and 2018 editions of the landscape. Collect them all! More importantly, for this year, you can get a free Excel spreadsheet of all 7,040 solutions plus a super hi-res PDF version of the graphic (100MB) — suitable for printing wall-sized, if you’re so inclined — in exchange for giving me permission to email you about new content and events I’m doing. The team at Blue Green, who did the graphic design work for the landscape last year, stepped up to lead production for the whole effort this year, including our data research. A team of 9 people worked on this for many months! We also built on contributions from Anand Thaker in 2017 and 2018. I am deeply grateful for the magnificent work they did. I expressly grant permission to reproduce copies of this graphic in full and “as is” in any slide presentation or website, up to a resolution of 1,600×900 pixels. (Or embed the graphic from my CDN). For higher resolutions or uses, please ask first. A backlink to this post would be greatly appreciated. This graphic is only our personal approximation of the marketing technology space and is surely rife with errors and omissions (our apologies). It is intended only to stir discussion. You can publicly identify or clarify your company in the comments section below. Key resources used in our research to build this graphic: CabinetM, Capterra, G2 Crowd, Google, LUMA Partners, Siftery, and TrustRadius. We used these services to discover new companies and to triangulate our categorization. As always, a debt of inspiration is owed to Terence Kawaja, the godfather of vendor LUMAscapes. Ever since I started this project, the martech landscape has grown year-over-year by double or, originally, triple digits. The 2017 edition had 39% more solutions than 2016. The 2018 one had 27% more than 2017. Its growth has been slowing, a kind of law of large numbers inevitability. But when you’re talking thousands of solutions, double-digit growth is still pretty massive. The 2019 edition, however, only grew 3%. 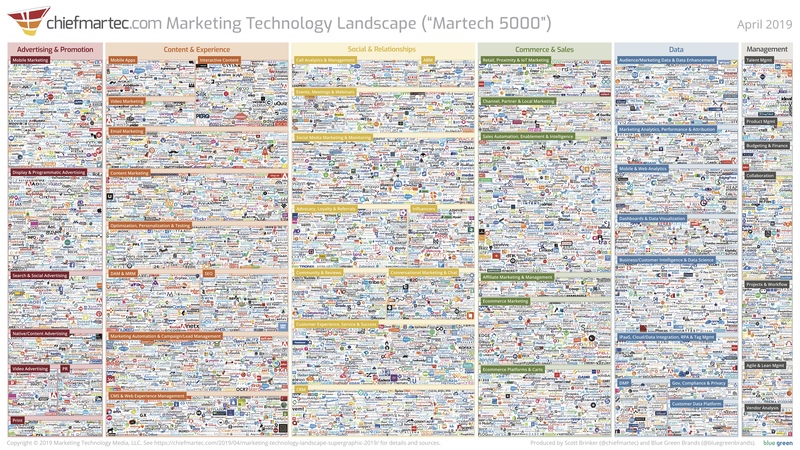 7,000 marketing technology solutions isn’t exactly a “consolidated” market. We’d have to compress the industry by an order of magnitude or two — to 700 or even 70 — before that adjective would apply. See, there is a limit to how much time is reasonable to invest in producing this graphic. One could argue that I should have hit that limit several editions ago. But this year, having 9 people working on it for 3-4 months was as much as even I could justify (or afford). Yet we know there’s a ton more marketing technology solutions out there. Not hypothetically speaking. 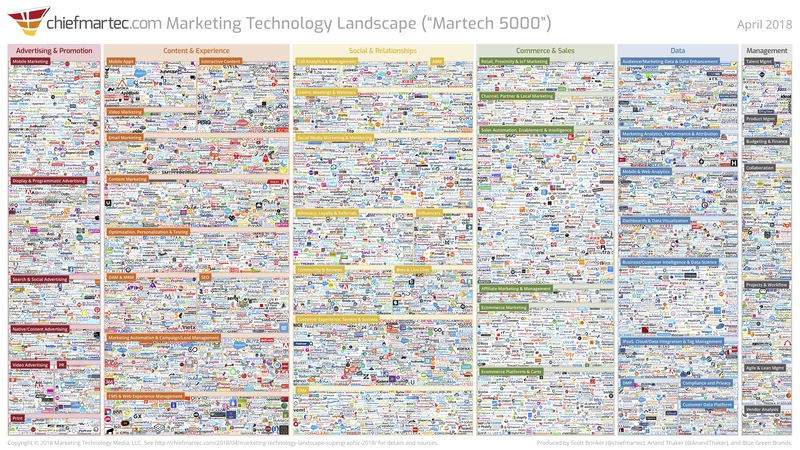 I can actually point you at hundreds to thousands of martech products that aren’t on this year’s marketing technology landscape. Starting with regional martech apps, I’ve been amazed over the past couple of years by the number of people who have created “national martech maps” for different countries, charting all — or as many as they can find — marketing technology companies headquartered there. There’s the Canadian martech landscape, the Finnish martech landscape, the United Kingdom martech landscape, the Chinese martech landscape, the German martech landscape, and just released this week, the Swedish martech landscape. It’s impressive. I think of it as the Martech Olympics. Since I’ve been so impressed with these, I’m embarrassed to say that we didn’t think to cross-reference this when we were assembling our global landscape this year until after it was off to press. We missed hundreds of regional martech companies. And that’s just considering the handful from countries with a published landscape. Similarly, while we’ve certainly incorporated many vertical industry martech apps into our landscape, we know we’ve barely scratched the surface of what’s out there — companies like LabWorthy in the dental industry or ChurchCRM, neither of which are on our landscape. Just finding these companies, without going deep in every industry ourselves, is a Herculean task. Each of these trends — the growth of platform ecosystems, the blending of software and services businesses, and the rise of citizen developer platforms — are birthing whole new galaxies of martech apps. While many of the products listed in these ecosystem marketplaces are included on our marketing technology landscape — primarily those that operate across multiple marketing platforms — there’s a growing number that are uniquely built for an individual platform’s ecosystem. They aren’t as easy to discover outside of those ecosystems, but within them, they can be apps greatly loved by those communities. And some of those communities are quite large. As one example, check out OrgChartHub, a product built specifically for HubSpot’s platform. I have no idea exactly how many of these aren’t on our marketing technology landscape, but mathematically, I know it’s more than 47,840. Forget the Martech 5000. Are you ready for the Martech 50,000? Now, I’m not saying all these martech apps and platforms are equal. There are many orders of magnitude difference in scale between a major marketing platform company like Adobe and a WordPress plug-in such as Social Warfare. That’s not a knock against Social Warfare by any means. In fact, I just installed them on this blog, and I absolutely love their product. They don’t need to be a $120 billion public company to delight me as a customer. But all along this continuum, useful martech apps are thriving. In context, each has value and purpose — however broad or niche — to the marketers they serve. Indeed, this is one of the most compelling arguments for major marketing platforms to embrace an open ecosystem strategy: the splendid diversity of specialized apps that can flourish on that foundation. That’s where the magic happens, where the energy and intelligence of engineering teams within platform companies is multiplied by all the energy and intelligence of hundreds or thousands of imaginative, third-party app developers. That massively distributed engine of innovation serves the myriad of needs and desires across different customers. The blending of software and services business models is another rich source of martech apps that we’ve had a hard time cataloguing. Major consulting firms such as Deloitte, Accenture, and PwC all have their own martech products now, lending credibility to the model. But a large number of services-developed martech apps are emerging out of smaller firms too. Blue Green, who produced this year’s landscape, is a great example with their Blue Green Analytics product. Their experience with conversion optimization engagements as a services company helped them identify a gap in the martech tool universe that they could uniquely fill. And because it plugs in to major marketing platforms, it’s easy for customers to adopt. Finally, there’s the category of “citizen martech” — apps that non-programmers can create using low-code or no-code platforms. 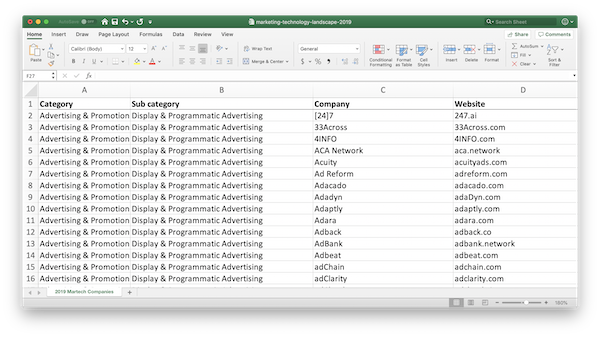 Airtable is one of my favorite: if you can work with a spreadsheet, you can build a martech app. Seriously. This democratization of development in marketing technology dramatically expands the number of people who can create martech apps. As a result, a lot more martech apps are produced — even if they’re relatively small and serve a highly specialized function. The long, long tail of martech apps just got even longer. So, I think we can safely say we’re not at “peak martech” — even if, at least for this year, we’ve reached peak martech landscape. The truth is that marketing and marketing technology are changing. The challenges of trying to chart all these different martech apps — and running into philosophical debates of what qualifies as an “app” in a world of tens of thousands of pieces of software that could each claim to belong in that collection — is actually a pretty good reflection of the underlying evolution of software in general. 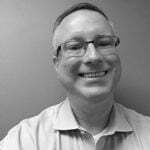 While individual categories on the marketing technology landscape — and the larger vendors operating within each of them — continue to jockey between expansion and consolidation, all of this is happen against a backdrop of ever more apps, components, services, and platforms steadily expanding for the foreseeable future. So this year’s marketing technology landscape is less complete than ever. But still hopefully a visceral representation of just how expansive and varied the field of martech software is.